An indispensable tool for wax model making. Carving, shaping, texturing and sizing are done in a minimum amount of time. The graduated dial adjustment (9 settings) allows accurate temperature control. Slim, 5/8" diameter handpiece is lightweight (1 oz.) and allows fine control, especially for intricate work. Measures 4" long without tip. Reaching with handpiece is easy with the flexible 26" cord. 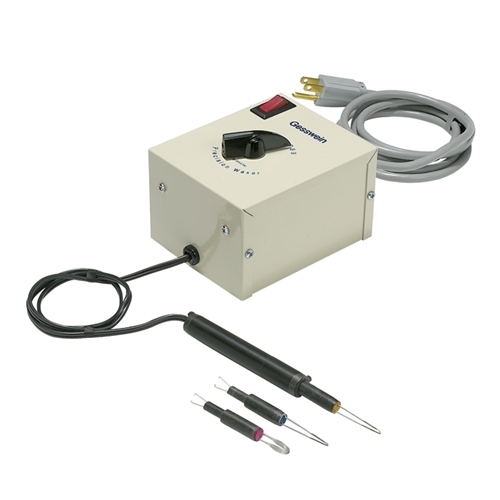 Features include mounted handpiece holder, pilot light, on/off switch. Complete with 3 tips (Red, Yellow & Blue). Additional tip shapes sold separately, see "Related Products" below.